Out of all of the smaller factions of Order, the Order Serpentis really stood out to me. There's just something cool about a knightly order that rides what amounts to velociraptors into battle while being commanded by a dragon riding lord. So what is it about this faction that caught my attention? First thing first, I'm no Russ Veal or Dan Heelan when it comes to analyzing a unit's worth in the game. I like to think I'm a fairly good player, but I usually approach things from a thematic angle first, and then try and work out how I can make that the most effective it can be. When I was perusing though the different factions Order Serpentis caught my eye. The old Dark Elves always interested me in a way, but as a whole I just wasn't too bothered with them. Now that they're divided up into smaller factions, it allows a bit of a clean break from their old lore. 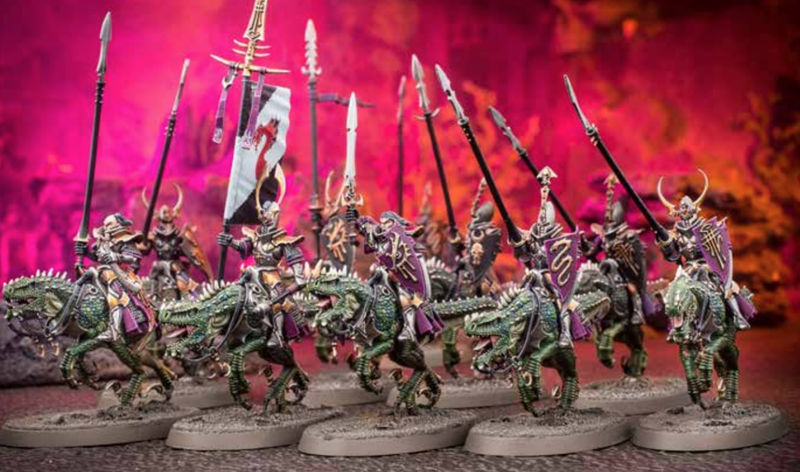 I don't have to picture the Order Serpentis as part of the Dark Elves, instead they are a knightly order of aelves with a foul temperament who ride to war atop dinosaurs. That's just plain cool. There's something about the limited model count that calls out to me too. It really allows you to hone in on what you have available to you and make it work instead of having a little bit of everything. So, let's take a look at the units. There are four units in total, one leader, two battleline, and one behemoth, as well as a battalion. This may be a hard faction to play at a full 2,000 points due to the repetitiveness of it, or should I say it might be a little challenging to paint that many of the same model. At the Vanguard level of 1,000 points though, or even at 1,500 I think it can really shine and be a lot of fun to play. This guy is the main damage output of your army. He's got a ton of attacks, with the ones from his dragon being particularly effective. It's got a bite that has 3 attacks, hitting on 4s, wounding on 3s, with -2 rend and doing D6 damage. That's a big wallop. On top of that there are claw attacks doing 2 damage, and the attacks from the rider, which vary depending on what you arm him with. Personally I would always take the shield since then that gives you a 4+ re-rollable save. The Noxious Breath attack is pretty decent too, giving you some mortal wound output. Besides just being a very mobile beat stick, he also has some pretty good benefits for your army as a whole. If any friendly Order Serpentis unit flees within 3" of him then no other Order Serpentis units need to take battleshock test that round if they're within 14". That's basically a free Inspiring Presence ability, but you do need to lose some models for it to work, which can be a bit problematic with such a low model count army. His command ability is good too, allowing you to re-roll all wound rolls for a friendly Order Serpentis unit that round. Keep in mind that can be used on the Dreadlord himself if you want. For his Command Trait I would take either Reckless or Master of Defense, depending on whether you want him to be more survivable or not. As far as the Artifacts go, I think the tried and true Quicksilver Potion wouldn't be a bad choice, but the Phoenix Stone looks interesting too. Couple that with Master of Defense and a shield to re-roll saves and you could get a super tanky guy who's hard to kill. I just really like this guy. He's good in combat, synergizes with the rest of your army, and will look great as a center piece model. You obviously need at least one of him in your army, but at a 2,000 point game I could see at least two of these flying around causing havoc. There's just something undeniably fun about pushing a big beasty around tearing up your opponent's army. These guys are the meat and potatoes of your army. They fill one of the battleline slots, and are also you're most numerous unit, with 5 models per unit. My only problem with them is that they're a little bit weak. The riders each only have 1 attack, which only puts out 1 damage with no rend. They get better on the charge, with a +1 to their wound roll and damage, but it's still only 1 attack per model. The Drakespawn gets some attacks too, but they're nothing spectacular. They are a bit resilient though, with a 4+ save, 2 wounds, and the ability to re-roll saving throws of a 1, or a 1 and a 2 in combat. Stick them in some cover, or mystic shield them and they'll stick around for awhile. Just like everything else in the army, they are very mobile too, so you won't have any problem maneuvering around the table. You'll need these guys to grab objectives, but I wouldn't rely on them to dish out a ton of damage. You can tie stuff up while you're bigger fighters come over to lend a hand, or use them to pick on weaker units, which is pretty in keeping with their bully like nature to be honest. Despite them not having the best stats, the models are great. They're fairly new, although I guess they are some of the older plastics from the Dark Elf range. Despite that, they look like modern sculpts, and the Drakespawns are just vicious looking. 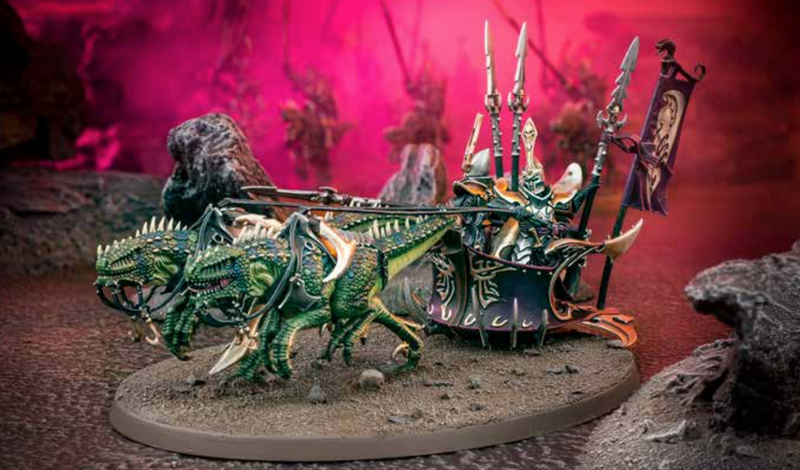 Having several units of these swarming around your Dreadlord on his Black Dragon will just look awesome, and there will be few armies that will be able to keep up with your units as they zip around the table. I have heard the mold lines on these can be a bit aggravating, which is always a danger the older the kit is. To be honest, this is one of the main reasons I've held off on taking the plunge so far, but it's not a huge deal. The amount of texture on the Drakespawn themselves lends them to quicker painting methods as well, like dry brushing and washes. With the advent of the General's Handbook 2017, these bad boys are now battleline for Order Serpentis, which frees you up a bit from having to spam Knights if you don't want to. They have less damage output than the Knights, with only 2 attacks from the crew, and 4 from the Drakespawn at about the same stats as their mounted counterparts. Despite this, they do have a cool ability to inflict mortal wounds on the charge. For every enemy model within 1" of it after a charge you roll a dice, on a 6 you inflict a mortal wound on the model's unit. It's not guaranteed, but if you position the model right you can maximize your damage. Just imagine this guy Tokyo Drifting into a unit so it's side is presented, doing the most damage. They also have a ranged attack, which isn't great, but does give you a bit of a bite from afar. With 6 wounds and a 4+ save they're okay with their durability, but rend will really start chipping away at them quickly. They're 60 points cheaper then the Knights though, so it's a fairly priced unit I think. When I remembered these guys can be taken in units my mind started racing with ideas. How cool would it be to see units of 3 of these guys zipping around? You could make an entire army of chariots and Dragons! I don't know if it would be terribly effective, but it would look awesome. I'm toying with the idea of at least 1 unit of 3, although 3 units of 1 may be more effective since they can split up if you need them too. This guy is a little tanky and a little awesome. He can really dish out the attacks, with a short ranged breath attack at -1 rend, and a good amount of attacks in combat, most of which will be doing D3 damage at -1 rend. The best part about him though is that he heals 3 wounds in each of your hero phases. When you couple that with the 4+ save and 12 wounds, this guy could stick around for awhile. The biggest liability with this model is its speed. Even though it starts out at an 8" move, that's still the slowest in the army, so you may struggle to keep up. To compensate that a bit he does get to charge 3D6 and discard the lowest, although there is a slight chance you may hurt yourself when you do so. All in all it's a pretty solid choice. I would take 1 in 1,000 points and possibly 2 at higher point level. The ability to regen wounds should frustrate your opponent a bit, and require them to really focus on this monster to make sure it's dead. Plus, it's just a cool model and another chance for you to add a cool monster into your army. The army's sole Warscroll Battalion, the Ebondrake Warhost, is okay. It consists of 1 Dreadlord, 2-3 Drakespawn Knights, 1-2 Chariots, and 1-3 Hydras, which is all stuff you're most likely going to be taking anyway. These are the best kind of battalions in my opinion, since it makes collecting them that much simpler. You get to re-roll wounds of 1 for every unit in the battalion, which honestly, is pretty freaking good. This is definitely the better ability from it, since the other one just lets you attempt to charge in your hero phase if the unit is within certain ranges of stuff. You don't get to fight though, just charge. I guess this is good if you're uncertain if you'll make a charge or not, since if you fail in your hero phase you get another shot later in your turn. The biggest benefit to me is the ability to one drop your army. At a smaller points level you should be able to fit everything you need into this battalion, while at a larger points level, I imagine it will most likely just be an additional Dreadlord and some allies that aren't in the battalion. The additional artifact you'd get wont really come into play unless you take a second Dreadlord as well, so you lose that at smaller game levels. If I were to do an army of these I would most likely take this battalion since it's only the cost of a unit of Knights. The re-rolling wounds of 1 and the ability to one drop are just too good to pass up. Plus, I just like collecting my army into battalions where I can. 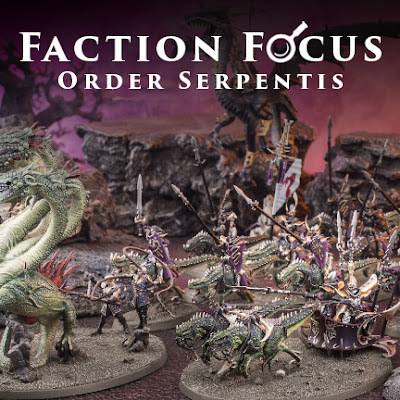 The Order Serpentis has access to ally with the rest of the Dark Elf factions and Stormcast. I would probably take a Sorceress or two from the Darkling Covens, just so you have some magic output, and maybe some shooting from either Darkling Covens or Stormcast. It's up to you though, and I would try and focus it around whatever your theme is. They could always do with some more bodies for claiming objectives, so some of the Covens infantry or Witch Elves wouldn't be a bad idea. At lower points levels I would just stick with the Sorceress though. At 2,000 points you could even take the Sorceress on Black Dragon, which would fit in even better with the theme of the army and has another fighty dragon for you. Like I said earlier, with the splitting of the Dark Elf army into smaller factions, I really feel like there is a ton of room to breath narratively. 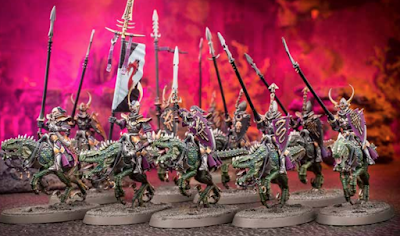 You could stick with the tried and true background of the Dark Elves but with an AoS twist, but I think there is so much more to these guys than that. Like I said earlier, they're a knightly order who ride dinosaurs, and have a bit of a vindictive streak. Being vindictive doesn't mean then have to be the torture elves they were in the Old World though. 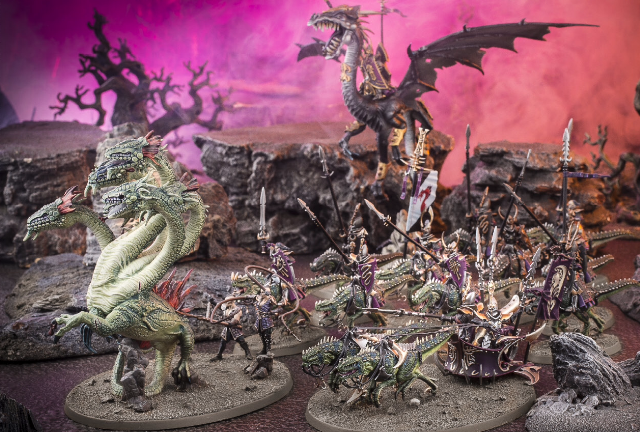 What about a Rohan type nation, but with Aelves, and the all ride Drakespawn, or a volcanic themed army from Aqshy with fire lizards? When I saw them my mind immediately went to my own setting of the Endless Deserts and how I could fit them in there. Instead of a shining knightly order, I pictured something more vagabond, more outcast, more roguish. The idea behind this army would require a bit of converting and sculpting, but not a whole lot. The main idea would be to replace their heads with the wrapped heads from the Dark Riders kit and sculpt a bit of a tattered poncho on them. This would make them look a little more like outlaws, as well as protect them from the desert sands. That coupled with a suitably ragtag paint job, and I'd have the Order of the Horned Drake. Swathed in a thin veneer of honor and civility, the Order of the Horned Drake prowls the desert wastes seeking out what scraps of glory it can find. Led by the opportunistic Melok Voidrider atop his black dragon, Ilzryrth, this group of mercenary aelves sell their services to any willing to pay the price. Those unlucky enough to stumble upon the knightly order amongst the dunes will swiftly find themselves at the dangerous end of a sword if they lack the coin demanded for their safe passage. Despite their unscrupulous reputation, the Order of the Horned Drake is found amongst the forces of many a warring army, for their skill and expertise are highly prized. The knights of the Order ride to war mounted on the back of swift Drakespawns. These gigantic reptiles are found throughout the realms, yet the ones who call the Endless Deserts home have adapted perfectly to the extreme environment making them an excellent fit for desert warfare. Native to the canyons of the southern deserts, the Drakespawns reject the dominance of the aelves by nature, and must be broken in both body and spirit before a knight can claim one as their mount. Once tempered to the aelf’s will, they begin to adapt the same cruel nature as their new master, becoming bitter and filled with rage. Those knights yet to secure a mount of their own ride to war atop mighty chariots pulled by a pair of Drakespawns whose former owners have fallen in battle, for once the bond between rider and Drakespawn has been made, it is next to impossible to forge anew with a prospective aelf. Clad in iron armor, the knights of the Order of the Horned Drake have forgone the ostentatious helmets of their peers of other Ordos Serpentis, and instead opt for simple head wraps and cloaks to protect themselves from the sandstorms known to ravage the land. Reinforcing their fondness for massive beasts of prey, the Order also hunts down and enslaves the Hydras that make the mountain caves their home. Herded into battle, these monstrous serpents wreak havoc amongst the enemy lines, but are often given a wide berth, for it is not unknown for them to turn upon their enslavers when pushed too far. Legends speaks of how the Order was founded when Melok and his knights pursued tales of glory and gold into the Endless Deserts centuries ago. Hiring out their services during the Age of Chaos they reaped a massive profit before they were glutted on the bounty they had accrued. However, the Deserts do not easily give up that which it has claimed, and when the Order of the Horned Drake attempted to leave their sandy confines they found their efforts mysteriously hampered. Horizons shifted from one moment to the next, confounding even their most highly trained scouts and leading them in circles whenever they neared the desert’s borders. Even when passing through a stable realmgate in a city such as Bétone, they would find themselves deposited back amongst the dunes they left only moments before. Doomed to wander the Endless Deserts for an eternity, Melok has become a bitter and twisted being, with even the release of death an unsure commodity in Shyish. Honor must be upheld however, and profits to be collected, including the elusive secret to escape their desert prison; so the Order of the Horned Drake persists to this day, a black stain upon the golden sands. So, what are your thoughts on this faction? How would you tackle an army of them and what theme would you try and incorporate? Let me know in the comments below. Most importantly, if you already have some Order Serpentis painted up, please share some pictures of them.